Are you unsure which decking boards would be more suitable for your project? We give you the opportunity to take a closer look at our high-quality decking boards before you buy. 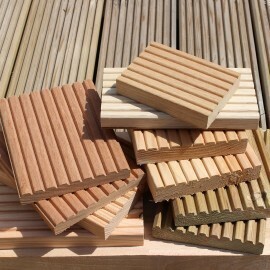 Here you will find a choice of samples of our wide range of timber decking. Our samples will give you an indication of the material, the grading and the grain of your selected boards.